1. I may not realize I’m not really hungry. I may actually be thirsty, lonely, or depressed and eating automatically comes to mind. I just ate an hour ago, so I’m conflicted. Should I eat or should I wait? 2. I’m also conflicted about what I want to eat or what I should allow myself to eat. Limitless dining options present themselves: New York pizza, Omaha porterhouse, Alaskan caribou prime rib, Montana buffalo filet, Modesto McNuggets, or just maybe Cabo blackened dorado! With very little thought or effort idea, lists can actually prevent solving any problem – but then again daydreams have very few calories, salt, fat, or carbs. 3. Predictable conflicts also arise as I look at the value or expense of each option. The Golden Arches beckon just around the corner from almost everywhere and a meal costs just a buck or so, but the fat content revolts me. I’ve heard from actual New Yorkers a place just across town makes real New York pizza to die for. I guess a little drive won’t kill me. They mail real Omaha steaks right to your door! Advertising never lies or exaggerates, right? The other ideas above are very intriguing, BUT I’m not sitting on that kind of resources at the moment. Besides, I want to eat long before the end of the two-hour drive to the airport, two hours in the airport, five hours in the air, crazy taxi drive to that special restaurant . . . You get the picture. Bottom line, conflicts are inevitable. They do not mean I’m crazy, unhealthy, or in danger of something. Conflicts only mean I have thought of more than one way to solve a problem and both ideas cannot be followed. Since I want to solve the problem, I have to find a way to choose one of those ideas. The process of moving from problem statement to problem solved is often a lot of unpleasant but necessary work. 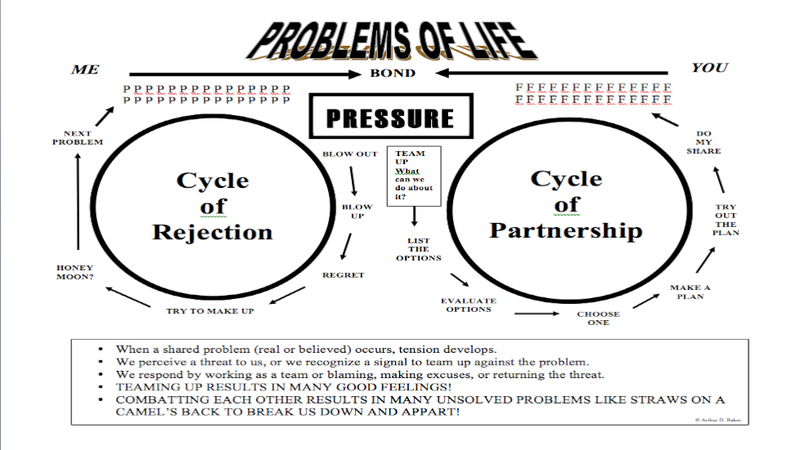 Conflicts are more inevitable when two or more people face problems. Tense conversations about a problem do not indicate problems IN the relationship, just that they have discovered a problem FOR the relationship to solve. They each think of a different set of ideas. Everyone likes their own ideas better at first, but must strive to understand what the others mean, and struggle with unavoidable confusion coming to that understanding. Every step of problem solving is more complicated when PARTNERS face and try to find solutions. Let’s look at how a pair might approach one of the problems we listed above: the ruined picture for instance. Dad might think of losing all of the student’s stuff for a while. Mom might consider moving to unknown regions to solve the embarrassment problem. Both would probably think of a myriad of other ideas that might work to make the gesture disappear. That would be a very good start but HUGE emotional reactions present the first chuck-hole on the road to a solution. Not a very endearing conversation. 1. Focus on one problem at a time. 2. Do your homework to develop a good list of options. 3. Determine the value of each possibility, which may require a bit of homework. 4. Choose the best idea. 5. Develop a sensible plan. First, COMMUNICATE. Solving problems starts when someone points out a problem. What did someone say, “Knowing the problem is half the solution.” (Dewey said it one way, Kettering another. Thanks, guys. I hate footnotes at the bottom. Everyone ignores them). Whether some generation long ago could read each other’s minds or not, we can’t. You don’t have to like it. You may not be very good at it. You may sound like an Okie or stammer. Get over it! Talking is still the first mandatory chore for partners solving problems. Silence sends a chilling message. No one likes a cold relationship, even the silent partner. So I have to say it even if I don’t sound gracious or kind enough to you at first. You may feel I am blaming you or wanting you to do something you don’t care to do. Strong emotions carry us down unnecessary detours for a while. I still have to start the discussion. Facing a problem with different lists of possible solutions in our brains creates confusion. The communication process creates more confusion, sounds clumsy, and sends strangely-coded signals at times. Still, conversations about a problem must occur, or it will become one of the collections of straws that break the relationship’s back. Your partner may need to fight the battle for clean and sober days alone within himself. Preserving the partnership may require a physical separation, packing belongings in bags and changing locks. The sober partner needs to take an equal role in the intervention that leads to recovery. Both may need to cease recreational drug use. Your partner must find sobriety on his own and for himself, but without your support, partnership ends. Don’t give up, but also don’t provide support that won’t help him stay sober. Talk to a local group that helps partners of addicts provide healthy support. Next DON’T SEARCH FOR BLAME. Blame is a stop sign. Every step towards who did wrong takes you farther from the solution. Individuals and couples come into our office completely exhausted under the load of problems they can’t talk about and so can’t solve. They sit down and the dam breaks. Out flows a crushing tide of grief, blame, and frustration. If the other partner (often the admitted guilty one) speaks up, they are cut off by another list of outrages. At some point tolerance terminates and someone exits the room or lets their own dam burst sending a toxic rush of disappointments with their partner. I have to separate them a few sessions until they understand. . . .
Keep telling yourselves PARTNERS CAN SOLVE ONLY ONE PROBLEM AT A TIME. Even if dozens of problems present themselves, don’t talk about any but the one you choose to work on today. It’s as easy to deflect as blame: “But we’ve tried that and it didn’t work” or “You do the same thing to me all the time!” “You make it sound like I did that on purpose!” Check your anger, focus, and contribute to the list of ideas that might actually solve the problem. Resist the temptation to interrupt the process. That disrespects your partner and yourself. HOLD HANDS THROUGH THE SOLUTION PROCESS. That means take one step at a time TOGETHER. The best solution is OUR solution. When your partner presents an idea, put it on the list. That small gesture, done with little comment except, “There’s an idea, thanks” expresses the real value and the deep respect you have for your partner. When you collect ideas, only talk about ideas, and make sure both present ideas or do homework that uncovers new ideas that might solve the problem. Don’t evaluate until all ideas are on the table as doing so rushes ahead of your partner, creating another point of separation. Then it’s time for BOTH to talk about what draws you to an idea or what problems an idea presents. After you’ve exhausted your team evaluation process, choose a solution idea UNANIMOUSLY. Neither can feel pressured to accommodate the other. Plan together and share the load of chores needed to see the plan through. Don’t drop any balls – finish your entire set of tasks. When you complete the plan, celebrate together and express your appreciation for the partner’s part. Problems happen. However, no two people envision the same solution at the same time, every partnership must follow the same path toward solutions, and every step must be taken together. A couple is not a partnership until they learn this simple, but challenging process. This entry was posted in solving problems and tagged argue, conflict, partnership, problem solving, team work by adbakermftmodesto. Bookmark the permalink.